Home » Kyzylorda of province nature. Trip and excursions to Small Aral Sea in Kazahstan. Tour and travel to Aral Sea in Kazakhstan. Water touring on Aral Sea. 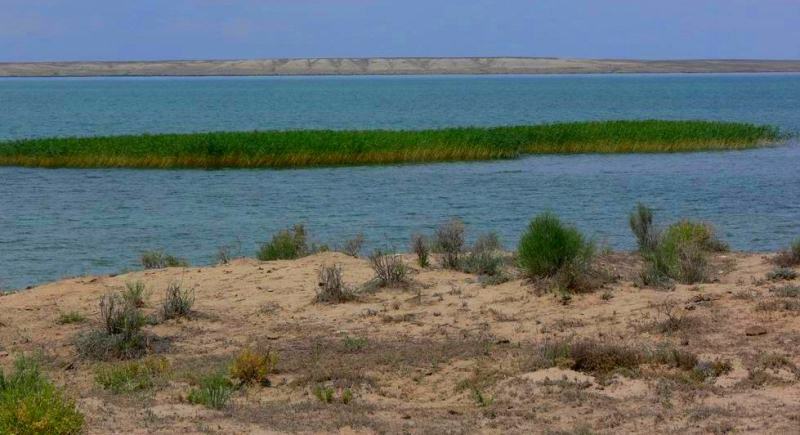 The lake Kambash (Kamyslybas or Kamyshlybash) is in the Aral district, the Kyzylorda region, in seven kilometers from the highway M 32, Samara - Almaty and in 86 kilometers from the city of Aralsk. The lake was stretched from the West on the East. In a northeast part of the lake there is a gulf Karapasat to the east of which there is an anonymous peninsula. Length of the lake is 26 kilometers, the greatest width is 8 kilometers, the largest depth is 16 - 18 meters, the average depth 2 - 2, 5 meters. The lake connects protowhich to the lake Laykol which in turn connects to some other lakes - Sarykkol, Kayazda, Laykol, Coolah, Koyazda, Zhalanashkol, Rayymkol, Suykkol, Karakol, Akshatau, Tushchybas. On transparency water does not concede to the Lake Issyk-Kul. In any place of the lake water remains transparent, from a bottom ground silt which disturbs transparency of the lake does not rise. Scientific research on the lake was not conducted, the nature of formation of a reservoir is unknown. A bottom, unlike other lakes, where it usually sandy or soil and silt. Locals claim that Kambash water has curative properties. Small wounds and grazes at fishermen heal directly in the eyes. These facts are not confirmed with medical certificates, but also not disproved. Experience of people with light skin shows how local suntan differs from beaches of the Syrdarya. It has a bronze shade and remains till spring. Water of the lake connects to the Syrdarya River, more salt also has an iodine smell. More than 300 days in a year on the lake Kombash cloudless weather. It is possible to see the most part of the lake from Temirsha hillock high 122 meters above sea level which is in a southeast part of the lake, near the settlement of Kymyshlybash, visibility from a hillock opens on 15 kilometers. From here all system of the lakes which are reported among themselves is well visible: Raim, Zhalanash, Kayazda, Laykol, and the biggest among them - the lake Kombash. Coast mostly sandy, places stony, generally flat and convenient for bathing. For fishing is to twenty species of fish here - a sazan, a pike, a catfish, a grass carp, a silver carp, a bream, a crucian, small fry.